Send money almost anywhere in the world in seconds, with the PayPal app. Manage all the ways you send, spend, and receive at a glance. It's a simpler way to securely move and manage your money. Send money across the table or around the world. You can send money to almost anybody in the world with just their mobile number or email address, with a little help from the PayPal app. They can use the money online or withdraw it with a tap. If they don’t have a PayPal account yet, they can open one in seconds. And there are no PayPal fees when you send GBP to friends in the UK from your bank, debit card, or PayPal balance. That’s money well sent. Track all your activity at a glance. 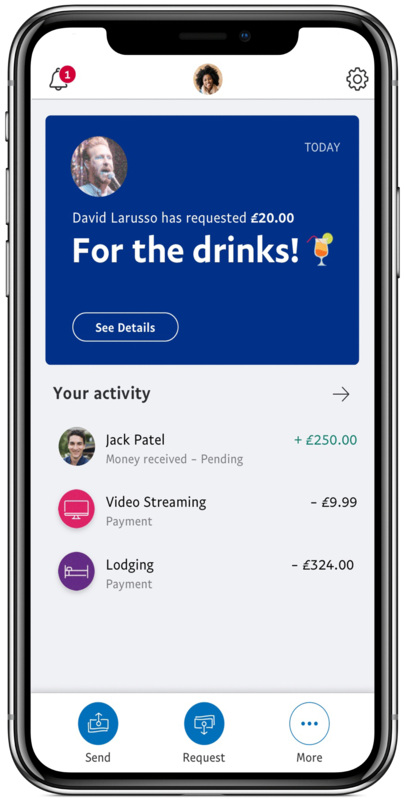 Whenever you buy something online, receive money from a friend, or send your share of the bill, the app will send you an instant notification to help you keep on top of it all. And however you fund your transaction, whether it’s with your bank account or PayPal balance, your debit or credit card, it’s all sorted here in one simple, more secure place. Simplify how you move and manage your money with mobile payments.